The Confederate flag in front of the South Carolina Statehouse was removed by an African-American woman on Saturday. She was arrested by local authorities, and the flag was soon raised again. The woman, identified as 30-year-old Bree Newsome of Raleigh, NC., was halfway up the 30-foot flagpole when State Capitol police told her to come down. Ignoring their calls, she continued up the pole and removed the flag. "The flag is gone," activist group Ferguson Action said on Twitter, congratulating "local organizers" for the operation. She was arrested upon her return to the ground, along with another man, 30-year-old James Ian Tyson, who had also entered the wrought-iron fence surrounding the flag. The two were charged with defacing a monument and face a fine of up to $5,000 or up to three years in prison, NBC reported. The flag, which is protected by state law, was raised again a short time later. The incident occurred just after dawn on Saturday, hours before a rally by flag supporters was scheduled at the Capitol. "The flag was replaced with a new flag within about an hour and no further damage was done," a statement from officials said. Rev. Jesse Jackson tweeted his support of Newsome's actions, saying:"We thank God that Bree Newsome had the courage to take the flag down." It comes less than one week after South Carolina Governor Nikki Haley said it was time for the Confederate flag to be removed from the Capitol building. “There will be a time for discussion and debate, but the time for action is coming soon,” she added. Debate over the Confederate flag – which many associate with the years of slavery in the American South – has been reignited following the fatal shooting at an African-American church in Charleston last week. The shooter, 21-year-old Dylann Roof, had posed with the Confederate flag in photos posted on social media. Since the shooting, a Charleston police officer wasfiredfor wearing Confederate flag boxer shorts in a Facebook photo. His police chief said the picture hampered the police force's“ability to improve trust and instill confidence when working with our citizens." But the debate extends outside the state of South Carolina, reaching all the way to Capitol Hill. US lawmakers have opted to delay a decision on a proposal to remove symbols of the Confederacy from Congress. Also in Washington, DC, the dean of the Washington National Cathedral said on Thursday that two stained glass windows at the Episcopal church that feature the Confederate flag should be removed. One week ago, White House spokesman Eric Schultz reiterated President Obama's views that the Confederate flag “belongs in a museum,” not waving in the air. 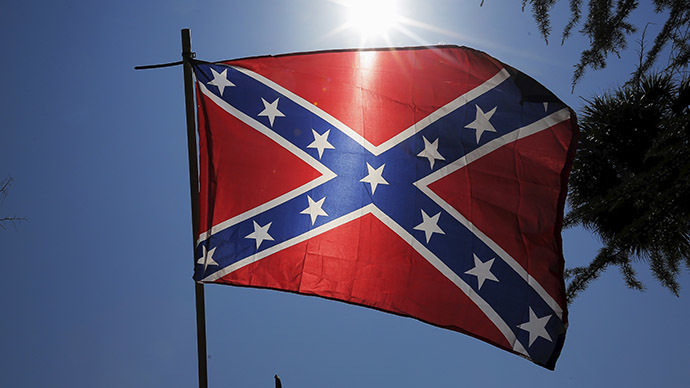 Meanwhile, Apple has pulled all apps that contain the Confederate flag from its Appstore. This follows decisions by other major retailers – including Walmart and eBay – to wipe Confederate flag merchandise from their shelves.